Being a huge fan of the Genesis version of PGA Tour Golf, I had been keeping an eye out for the SNES version. It was my hope that the Super Nintendo’s superior color palette would give this game a bit of an edge in the graphics department while keeping the high quality gameplay intact. Unfortunately I found the opposite to be true. Without getting too technical, the game environments are all rendered using the SNES’s “mode 7” texture mapping mode, which is a means of displaying a background layer in such a way that it can be rotated and scaled. Anyone who has flown an airship in Final Fantasy II or III or has played F-Zero or Super Mario Kart will be familiar with mode 7’s effects, which allow for an artificial 3-dimensional experience. 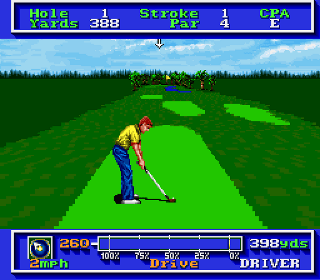 The downside to mode 7 is that the portion of the layer in the foreground has very poor resolution which makes it look blocky, so while this technique allows the SNES port of PGA Golf to position a virtual camera right behind the ball as it travels through the air, the environments have no detail closer to the players’ point of view but are more detailed in the distance, which is the opposite of what would actually look good. It also makes the animation, which is poor in general, rather choppy while the ball is in the air. I will say though that the clouds in the sky look absolutely terrific, and the golfer is a bit bigger and much more detailed. As with the Genesis version, this game features 4 courses, but trades off Sterling Shores for TPC at Eagle Trace. The shot meter moves a bit more slowly making it easier to get off a perfect shot, but the aiming system is annoying as the arrow cursor is all the way at the top of the screen, even when putting. For some reason this game does not employ the drop-down menus found in the Genesis version, which is a bit of a disappointment as is the presentation in general. PGA Tour Golf on the Super Nintendo lacks the atmosphere and almost television-like experience of the Genesis version, and while it isn’t a horrible game it is clearly the inferior version. Buy PGA Tour Golf on GameGavel or Amazon. Tagged EA, Golf, PGA, PGA Tour Golf, Review, SNES, Sports, Super Nintendo. Bookmark the permalink.